Photographs of baby animals playing together at a wildlife park in Beijing are melting hearts online. 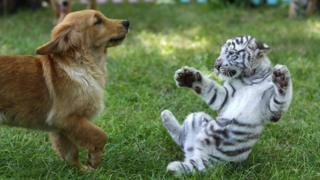 The images, taken on Thursday, show golden retriever puppies playing alongside lion and tiger cubs. They were all milked by the puppies' mother after the eight cubs - including Siberian tigers, a white tiger, spotted hyenas and an African lion - were abandoned by their mothers, reports said. The cubs have grown up together and have become close, local media reported. Beijing Wildlife Park says it has successfully raised abandoned infant animals, including bears, kangaroos and monkeys. The image set is trending on Twitter and has been shared thousands of times.